THE problem with reaching out to the internet hordes is that sometimes they reach back to deliver a swift slap to the face. Prime Minister Kevin Rudd popped up into the unpredictable world of Reddit on Thursday night, where questions were posed by users or "redditors". The highest-ranking questions float to the top as users vote for their picks. It is a risky exercise for politicians because the footing can be unstable online. 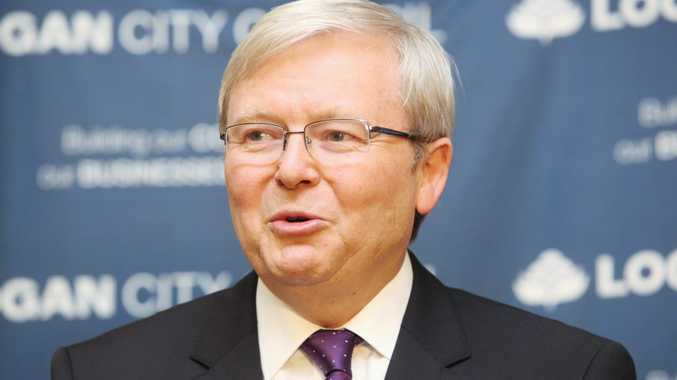 University of Queensland political science reader Dr Ian Ward said even with Mr Rudd being so much more comfortable with social media than Opposition Leader Tony Abbott, the tables could quickly turn. "You can't control the outcome like you can with television," Dr Ward said. "It's always risky because it's more interactive and less easily managed." Like US counterpart Barack Obama - who was quizzed during his own campaign for re-election - Rudd picked the questions to answer, appearing relaxed and casual in his responses. The Prime Minister was asked his stance on international surveillance being conducted by the United States, a question which went loudly unanswered. Dr Ward said the PM likely did a calculation and felt an answer could do more harm than good, so left it alone. Mr Rudd dodged questions about the government's heavy-handed asylum-seeker policies and drug reform, but did announce a $34 million package to build 10 new Headspace centres to improve mental health services. On Monday, Greens Senator Scott Ludlam will follow Mr Rudd's lead and enter the Reddit fray from 7am. It will be found at http://www.reddit.com/r/iama.